Japanese sweet flag grass is one of those plants with a proclivity for water which also happen to resemble flowing water. This makes it much admired and appreciated, at least in my book. When I design around a water feature, whether it’s a tumbling waterfall, a bubbling urn or a meandering dry creek bed, I most always employ Acorus gramineus because this evergreen grass-like plant mimics the way water flows, cascades, and spreads out in a carefree way. Japanese sweet flag grass, which belongs to the Acorus genus of wetlands grass, is ta friendly species for a home garden. Its sibling xommon sweet flag (Acorus calamus) is a taller species which is useful at the edge of a pond or to stabilize marshy soil. Above: Japanese sweet flag grass (Acorus gramineus) flows down a slope at San Francisco Botanical Garden. Photograph by Daderot via Wikimedia. Native to Japan (where Acorus occurs in wetlands and shallow waters), this narrow-leaf, densely clumping perennial erupts from rhizomes that lie below the surface. The “sweet” part in the common name comes from the pleasant aroma the leaves emit when broken. 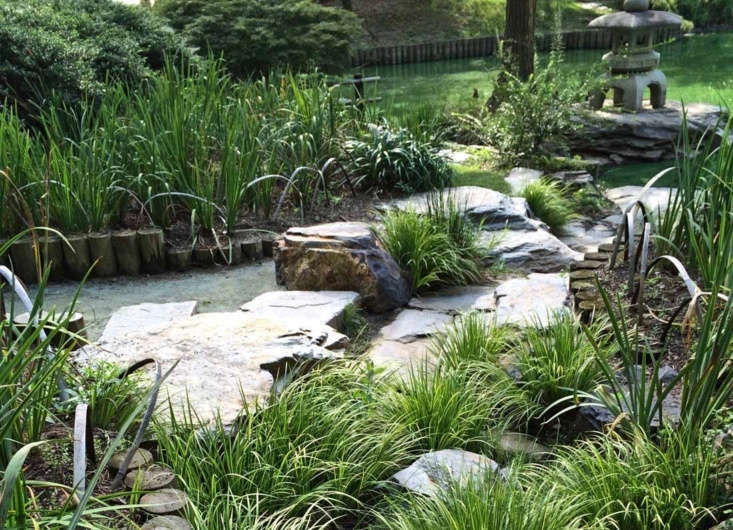 Acorus is frequently used around the edges of water gardens and ponds; it is happiest when allowed to drink water without too many restrictions as it gracefully softens the look of rocks. 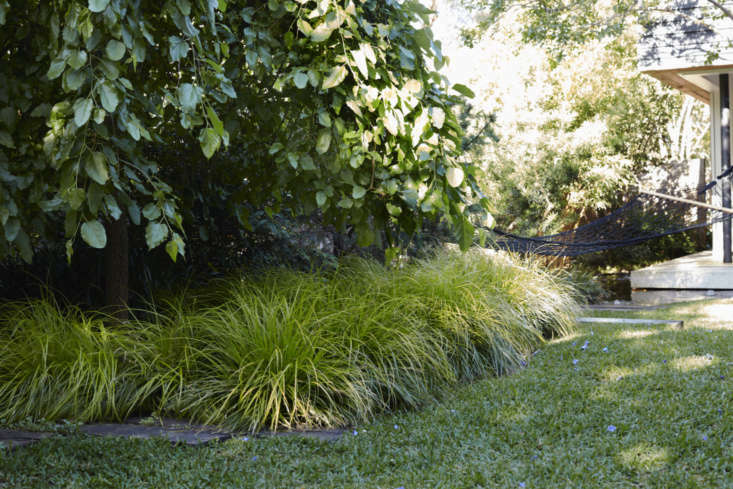 Above: When landscape architect William Dangar designed a garden for his own family (near Sydney, Australia), he incorporated a small backyard pond fringed by Japanese sweet flag grass. 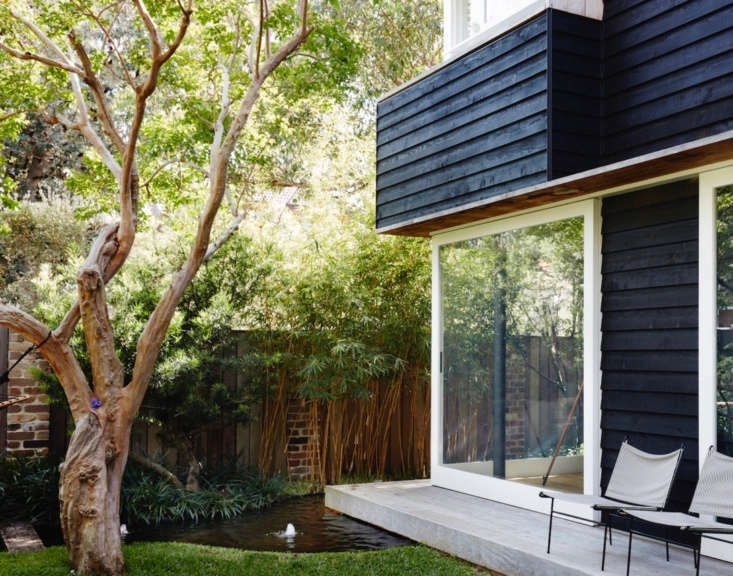 See more in Downsizing a House to Expand the Garden: At Home with Landscape Architect William Dangar. Photograph by Prue Ruscoe, courtesy of William Dangar. Side note: I once planted A. gramineus ‘Ogon’ near a pond’s edge and watched the sedge slowly and quietly creep closer to the water. It decided to become one with the pond and to magically float and expand on the surface. Eventually, of course, I had to remove large sections of the grass-like plant after it overtook the pond and “naturalized,”but I admired its tenacity. 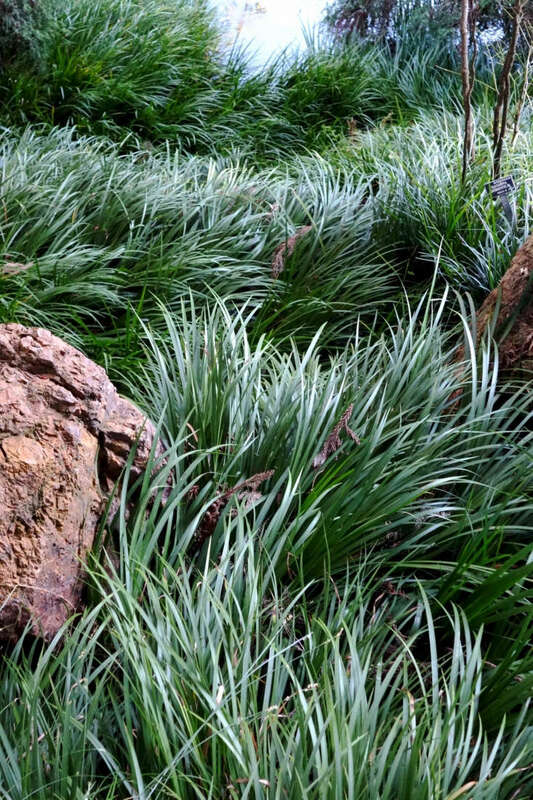 Above: Australia-based landscape architect William Dangar also uses Japanese sweet flag grass as a front-of-the-border ground cover. Here, in his own garden, it creates a gentle wave. Photograph by Prue Ruscoe, courtesy of William Dangar. Indoors, Acorus can be kept as a houseplant, living in medium to direct light with high humidity and high water (the pot may even be allowed to stand in a shallow saucer of water). Because Japanese sweet flag grass is a marsh plant, water it plentifully to ensure the potting mixture is always thoroughly moist. Above: On Washington’s Bainbridge Island, a path is edged with lime green Acorus gramineus ‘Ogon’ grass. 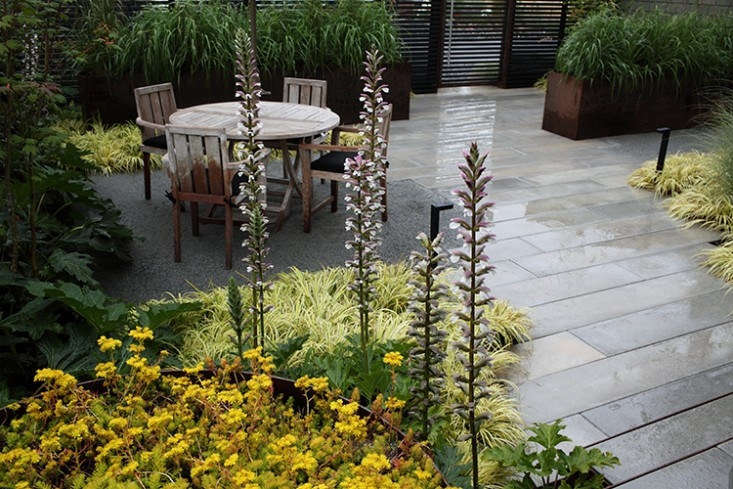 In the foreground, yellow Sedum ‘Angelina’ and tall spires of Acanthus mollis create visual interest. See more of this garden in Water’s Edge: A Saltwater Courtyard Garden on Bainbridge Island. Photograph courtesy of Wittman Estes. Acorus gramineus ‘Ogon’ is a dwarf cultivar of A. gramineus which grows to 10 inches tall and spreads slowly. It has vibrant fans of glossy pale green and yellow-striped leaves to produce an overall lemony yellow effect. Acorus gramineus ‘Variegatus’ is a variegated-leaf form with attractive creamy white stripes on its green leaves. It looks lovely paired with silver-leaf plants and white blooming perennials. It grows to 10 inches tall and 6 inches wide, while slowly spreading. Acorus gramineus ‘Pusillus’ is a petite grass-like perennial, growing typically 2 to 3 inches tall, but perhaps a bit taller with rich soil and regular irrigation. Though spreading very slowly, it’s considered to have more of a clumping habit. Plant ‘Pusillus’ in full coastal sun to light shade and irrigate regularly or keep in shallow water. Also, because of its low stature it acts as an excellent plant between stepping stones in moist areas. Above: ‘Ogon’ has a clumping form. A 6-inch plant in a 3-inch pot is $9.88 from 9EzTropical via Etsy. Japanese sweet flag grass is a beautiful accent plant or massed ground cover near water gardens, along streams or ponds, or in moist, open woodland gardens. 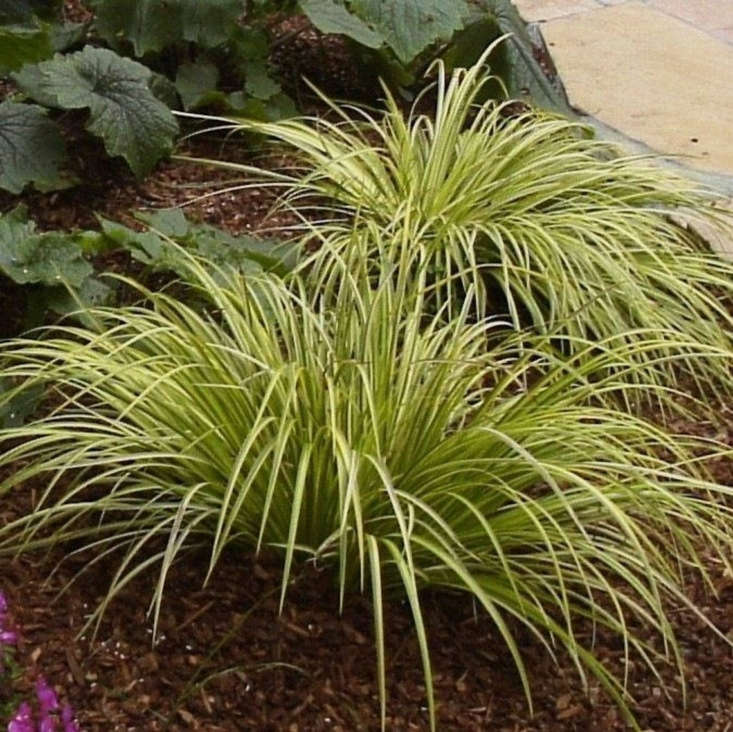 The variegated varieties of Japanese sweet flag grass brighten partly shaded to fully shaded areas. Deer leave this plant alone, thankfully. Above: For wholesale purchases only, see Hoffman Nursery for Golden Variegated Sweet Flag. Plant Japanese sweet flag grass in full sun to full shade, but be aware that more sun equals higher water needs. Acorus grows well in both boggy conditions, including very shallow water and consistently moist garden soils. Scorched leaf tips will occur if the soil is allowed to dry out, subtly letting you know that you are depriving it. Trim blades to the ground if a Japanese sweet flag grass is looking tattered or unhappy. Propagate this perennial by separating overcrowded clumps in spring or summer. Carefully pull apart the clumps with your fingers, making sure that a medium-sized piece of rhizome is attached to each section and treat each divided clump as a plant.